Featured Artists for Challenges #187, 188 & 189! 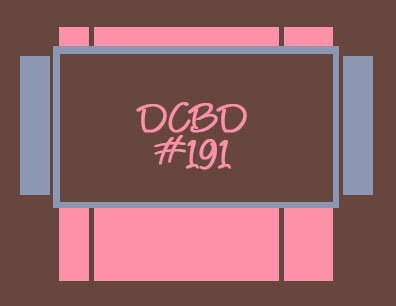 Good morning loyal DCBD followers! 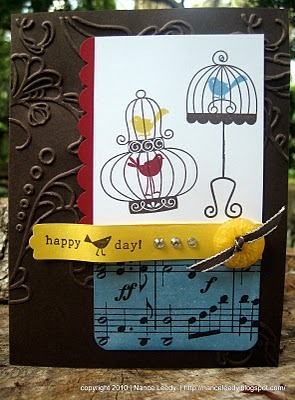 I hope your Sunday (or whichever day of the week you're visiting here) is a beautiful, sunny, relaxing day! And since you're here we hope you'll take a few minutes to check out our next three Featured Artists. A very special thanks to these talented ladies for joining in our weekly challenges and congratulations for being voted best entry for the week! 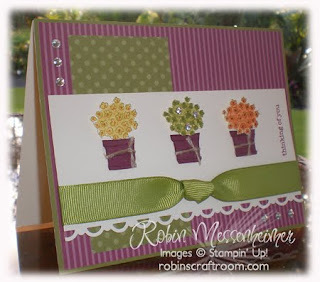 Isn't this just the most fabulous use of three of Stampin' Up! 's newest colors - Pear Pizzazz, Concord Crush and Early Espresso! The design of the sheet of the Greenhouse Gala Designer Series Paper set reminds me of vintage wallpaper, and the delicate botanical central image brings back memories of the botanical pictures hanging on my grandmother's sitting room wall. Just stunning, don't you think? Be sure to visit her blog and comment on it! 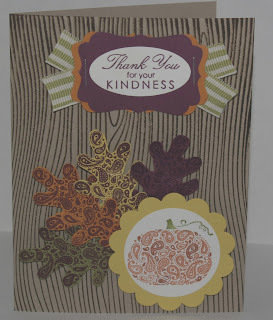 Let's lead into this a bit: OK, this is just a darned cute card. 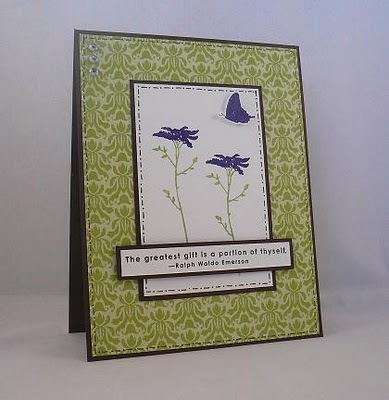 Look at all those wonderful elements - the stamped "ribbon" strip, the button with the Early Espresso Ribbon "tying" it down, the Newsprint Designer Series Paper brayered with Marina Mist ink. And of course the use of the challenge colors. 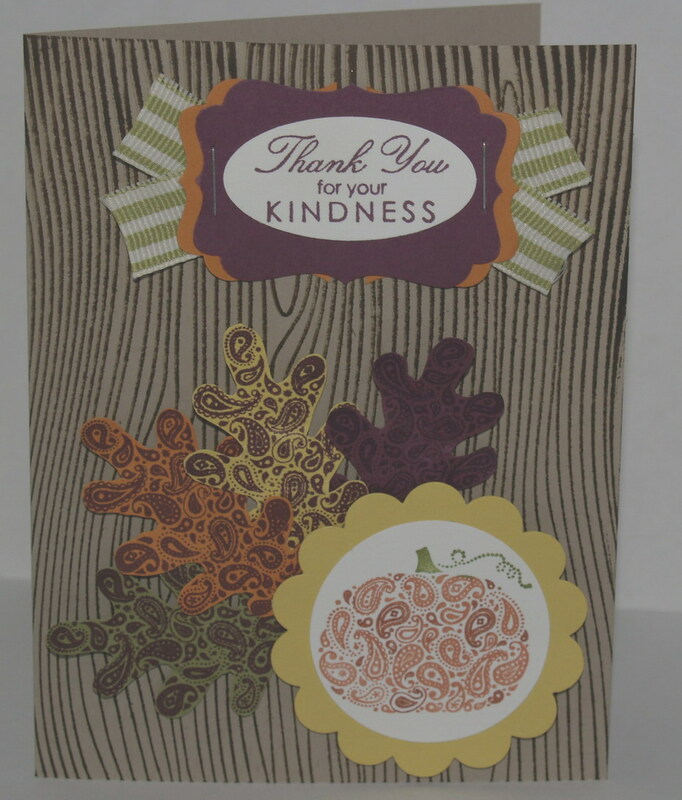 But the kicker to this card for me is the inside. 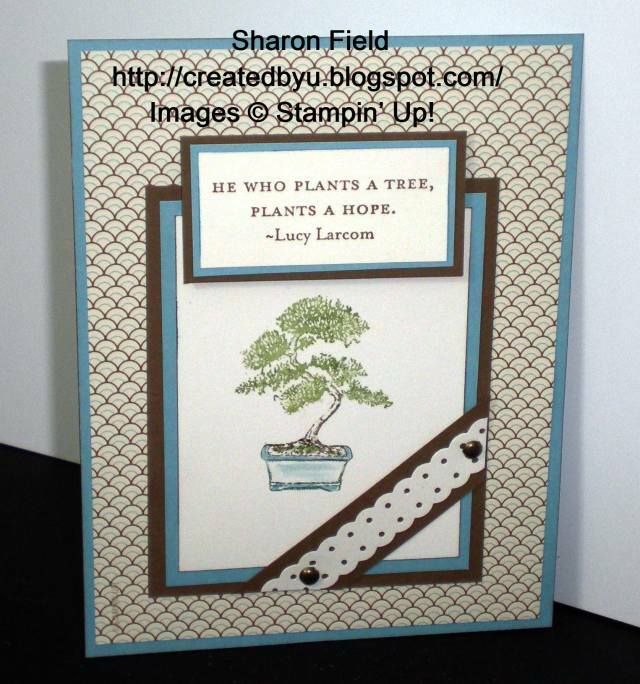 This one element of this card made me go order the stamp set. I am SO going to CASE it for my groups! 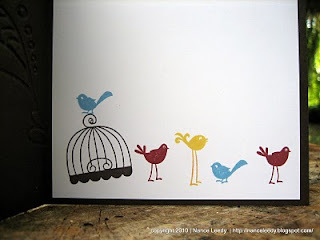 The birds are free!! Woo-hoo!!! You've just gotta love it! 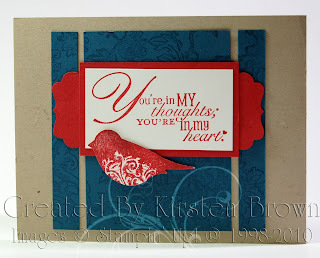 Don't forget to go comment on Krista's blog! Finally for today, let's give a Back-To-School cheer for Erica Cerwin for her entry in our Layout Challenge #189. What a fabulous Teacher's card! Or maybe it's for the bus driver? Whichever, I can't believe how perfect it is to have those busses climbing the "hill" in one of our layout elements. When I first saw the challenge colors I thought of fall, and I just wasn't ready for fall. But the back-to-school theme still feels like summer for me, and I'll never see a school bus again without thinking of Daffodil Delight! It's hard to decide which element of this card I like the best, but I'm thinking that using the stamp from Extreme Elements to simulate mud might just be it. 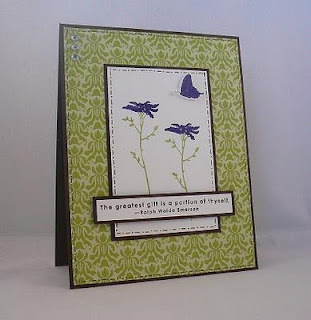 Be sure to let Erica know what you think about this fantastic card on her blog! We hope you'll enter our challenges, too! We post a new one every Wednesday morning. This week it's a fun sketch layout that really has me scratching my head to see what I'll come up with. I can hardly wait to see what YOU do, too! 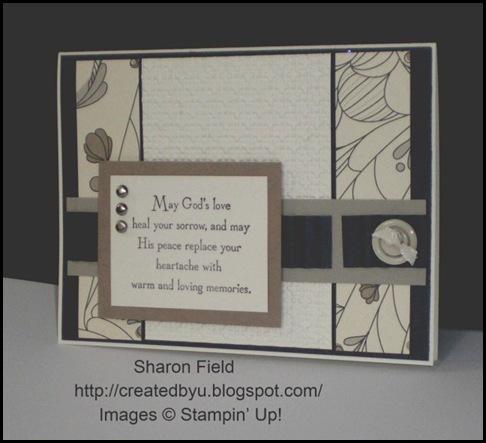 Welcome to Challenge Wednesday at Diva Coffee Break Designs! 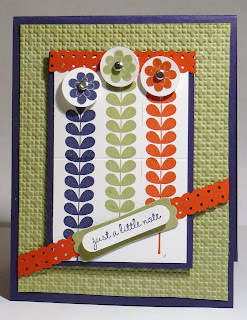 This week the Divas are featuring another fantastic set of colors, this time from the Stampin' Up! Brights Collection. There's one "old" favorite in Old Olive. Two of the others - Tangerine Tango and Rich Razzleberry - are from former "In Color" collections. 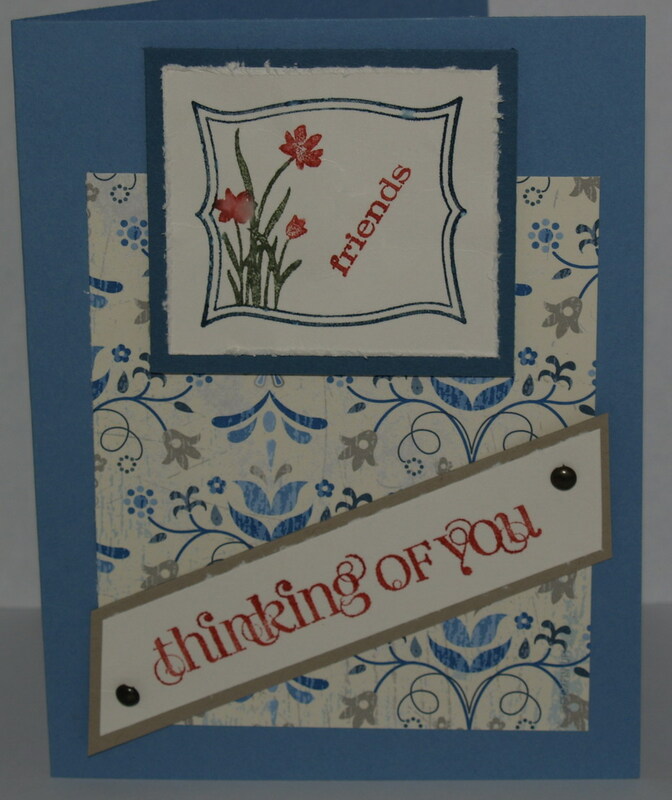 And then there's the delightful new Bright Color, Daffodil Delight. What thoughts and designs come to your mind with the colors? Even with the Divas, there is so much diversity from graphics to flowers and lots in between. We can hardly wait to see what you show us! 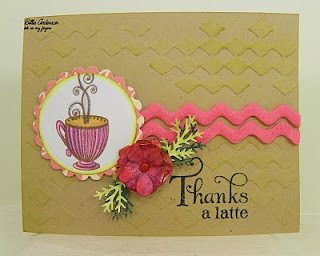 Exciting things are happening here at the Diva Coffee Break Designs blog, we have some new Divas! It was time to expand the family so we could share more of what we love with you. We hope that you will help us support and welcome the new talent here on the blog. This week we have another great sketch for you. Take a look at the samples we have for you and see where you can take it too! It's Time for Three More Featured Artists!!! First up for Diva Coffee Break Design challenge #184 Erica Cerwin with her bold and unique style! 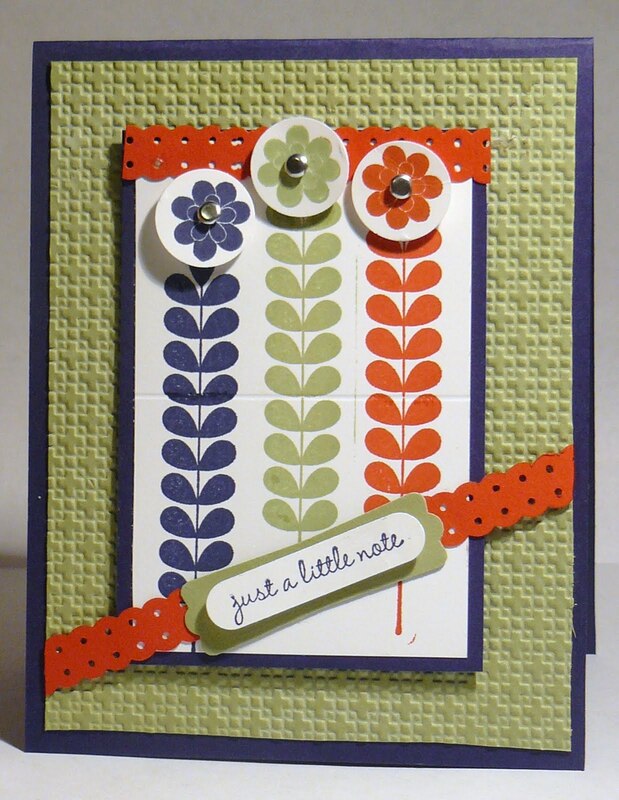 Don't you just love those crimped tone-on-tone dotted scallop ribbon pieces adding texture in the background?! 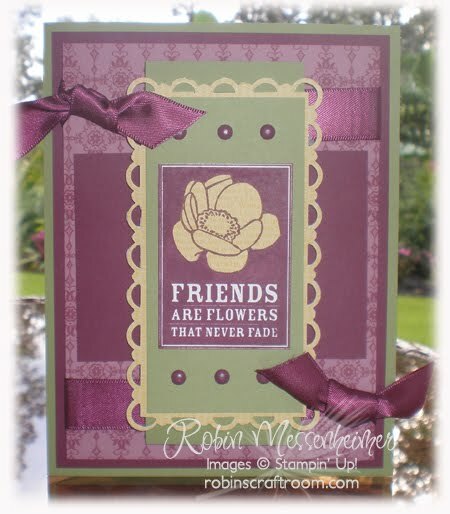 Love the way Erica put these colors together and showcased this great new stamp set, Word Play, with flair! 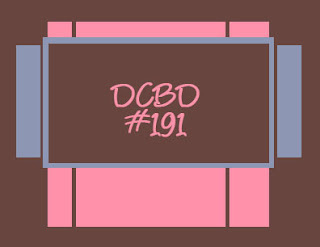 Next up, for DCBD #185 is Billie Anderson. Billie's literal interpretation of the sketch is fantastic! 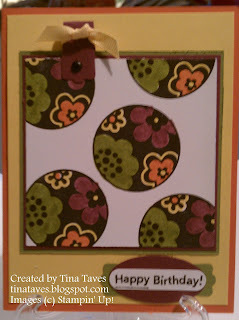 I especially love the texture on the Crumb Cake background and the pretty rickrack she says she made with a die! Ooh, I almost forgot to mention the text on the flower petals- how fun! 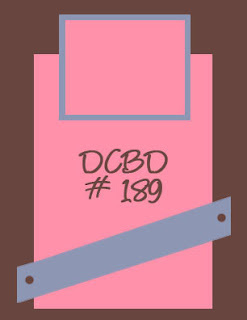 Finally, this lovely card by Kris Sobolik for our DCBD #186 Featured Artist. 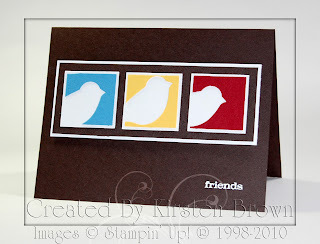 Our color challenge was no problem for Kris! 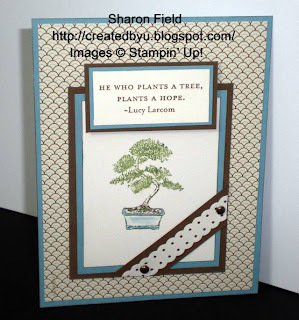 She used the grass from one of my favorite stamps, Inspired by Nature, with the texture of the Square Lattice embossing folder (reminds me of a beach mat here!) for a beautiful combination! 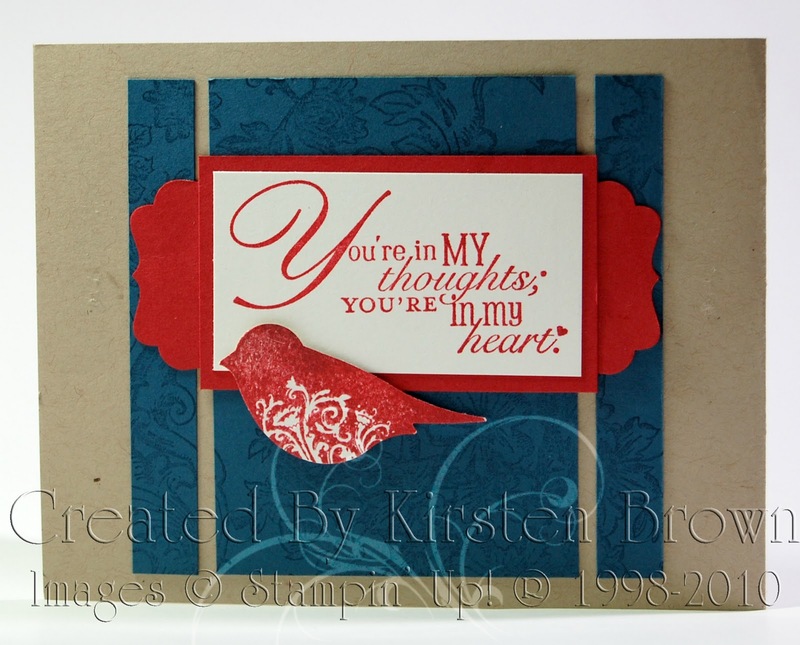 Thanks so much for joining our weekly challenges ladies! We do hope you'll continue to play along! Welcome back for another challenge Wednesday at Diva Coffee Break Designs! It is hard to believe it is August already. The year is more than half way over, and day I say only 142 sleeps till Christmas. 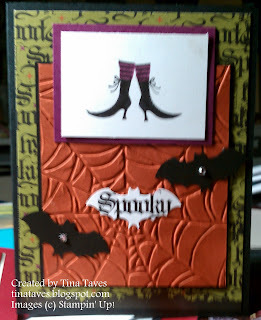 It is time to start warming up that crafting mojo for the holidays! 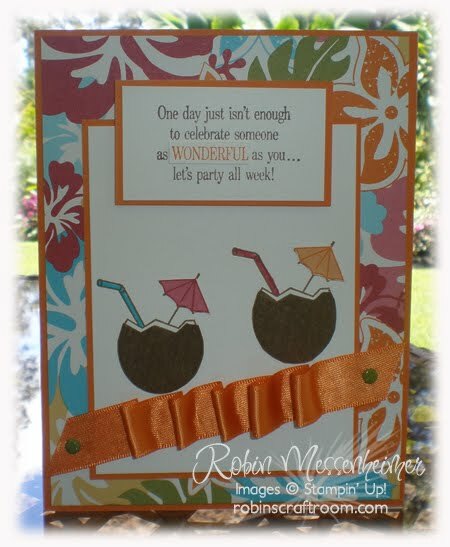 The perfect way to begin is with a fun color challenge. 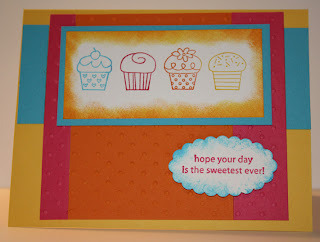 We have a great challenge this week using 4 of the brand new core colors to the Stampin' Up! color collection. 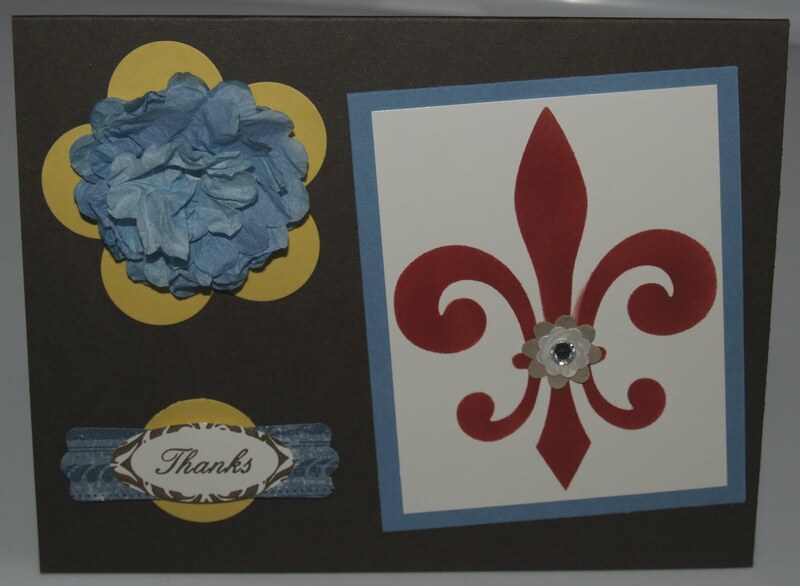 Take a look at the samples we have created for you and please play along with us by adding your link at the bottom.